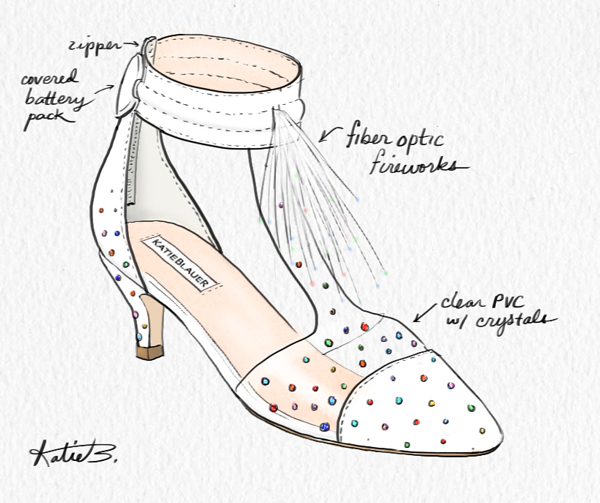 When I began my brainstorming for Jessica’s New Years Eve wedding shoes, my mind was focused on capturing the fireworks that would be exploding over us in celebration that night. 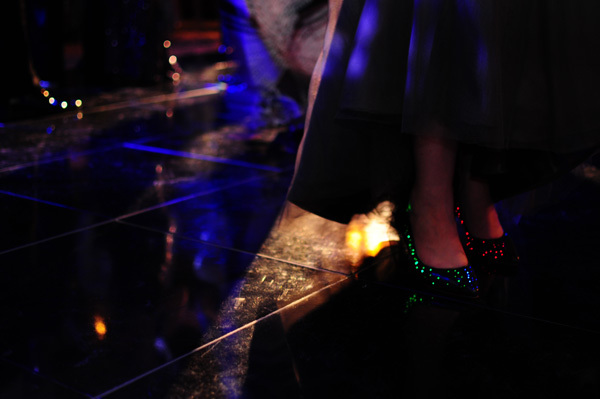 After bouncing some ideas around with my team, we decided I might actually be able to translate the spectacular event onto a pair of shoes using fiber optic technology. While my first sketch (shown below) was so non-traditional that it scared the bride away from the concept, I still thought this idea was too special and unique not to pursue, at least for myself. First, I ordered two packs of fiber optic hair extensions, which had the lowest-profile LED unit of any other light-up gadget I could find. 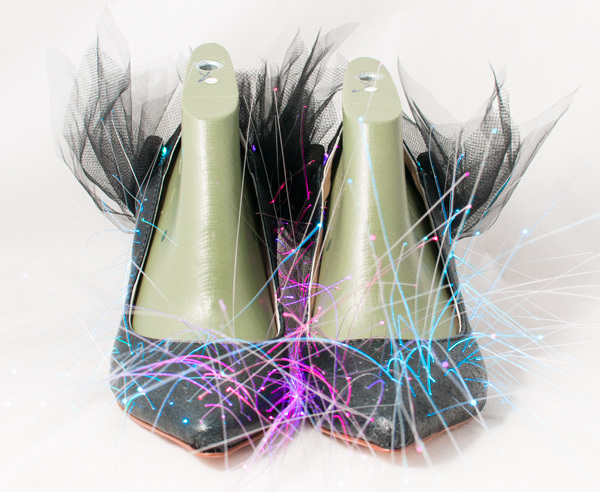 I designed the back half of the shoe to be a horizontal representation of my tulle mermaid gown, which also served nicely to obscure the battery packs. From there, I opted for a conceptual interpretation of the fireworks by laying the fiber optics under the upper and feeding each strand one by one back up through a pinhole in the material. The mid-process result was my favorite, as the shoes took on an avant-garde life of their own, most closely resembling the light-up waterfall of an exploding firework. Regretfully, the next step was to give the shoes a haircut by trimming each strand down to the surface of the upper. While this still allowed each little light to glow, I failed to cement the fiber optic strands securely enough between the layers of the upper, so as I danced the night away at Jessica’s wedding, many of them slipped back through their pinholes, disappearing under the leather. Despite the less than perfect wear-test results, working with this unique material for the first time was an exciting and fun experience that I look forward to perfecting in the future. 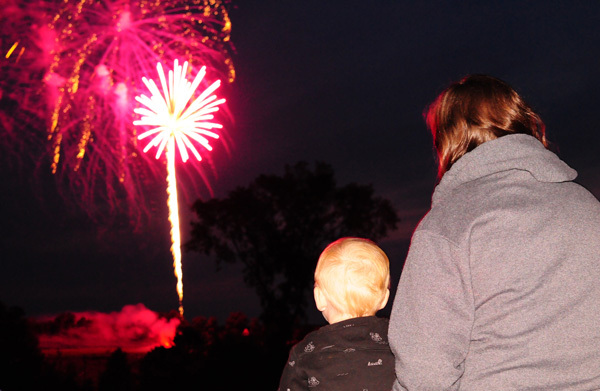 Have you ever noticed there’s something about watching fireworks that switches your brain into memory making mode? I’m sure Chris and Jessica will never see a fireworks display again without thinking of their magical wedding night and I have no doubt that you, yourself, have a special fireworks memory of your own! This entry was posted in gallery preview, shoes, technology. Bookmark the permalink.